PE is on Wednesday and Thursday for 1J and Monday and Wednesday for 1M. Your child will need a t-shirt, shorts and pumps that are clearly labelled. Forest School is every other Friday. Please send your child in their comfortable clothing (no uniform needed) and send extra layers on this day. 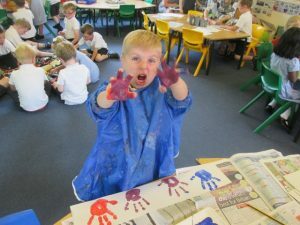 1J begin on Friday 7th January and 1M on Friday 14th January and this continues until Easter. We are out in most weather, but will let you know by text if Forest School cannot go ahead due to extreme conditions. Please read with your child as often as possible. Any books that they enjoy are perfect! We will send home a book linked to their current reading ability with a diary to record in. We will change your child’s book when the diary is completed several times and they can earn a certificate for reading regularly at home. We will send homework every Friday, which is linked to phonics. This needs to be brought in the following Wednesday. You can also use www.educationcity.com and www.phonicsplay.co.uk to play games using the phonemes we learn at school. Milk is no longer free, but is available to Year 1 children for 22p each day. Please pay online. Splendid Skies – a topic about the weather and seasons, though we also explore further out into space on a trip to the moon with Wallace and Gromit! They design and make moon buggies with moving wheels. Land Before Time is an exciting topic about dinosaurs and the children even get to become palaeontologists, dissecting dino poo to find out if they were carnivores! We have a strong emphasis on stories in English and they link well with our topic work. Paper Dolls by Julia Donaldson and Dogger by Shirley Hughes during Marvellous Me and Peter Brown’s Mr Tiger Goes Wild for Paws, Claws and Whiskers. In Year 1, we expect children to use phonic knowledge to help read and spell new words as well as applying them in writing. We use real and alien words to blend sounds. Alien words like ‘floosh’ are made up simply to help children blend for reading. They do not write or spell these words. In Maths we will building and securing our knowledge of number. The children will be reading and writing numbers to 20 in numerals and words as well as counting to 100 and back. We will also be working on addition and subtraction through a range of problems. The children will be solving these problems and recording them in simple number sentences. The children will be learning about one more, one less and counting in 2s, 5s and 10s. 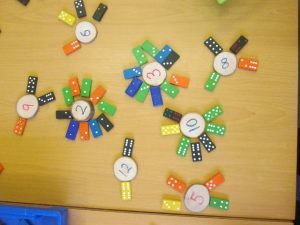 In Year 1, the children learn to recognise half and quarter of shapes and quantities.